We are pleased to announce that Polish artist Roksana Ciurysek-Gedir of Roxy Art has been invited to exhibit at Annoushka jewelers in South Kensington as part of their annual series, Art at Annoushka. 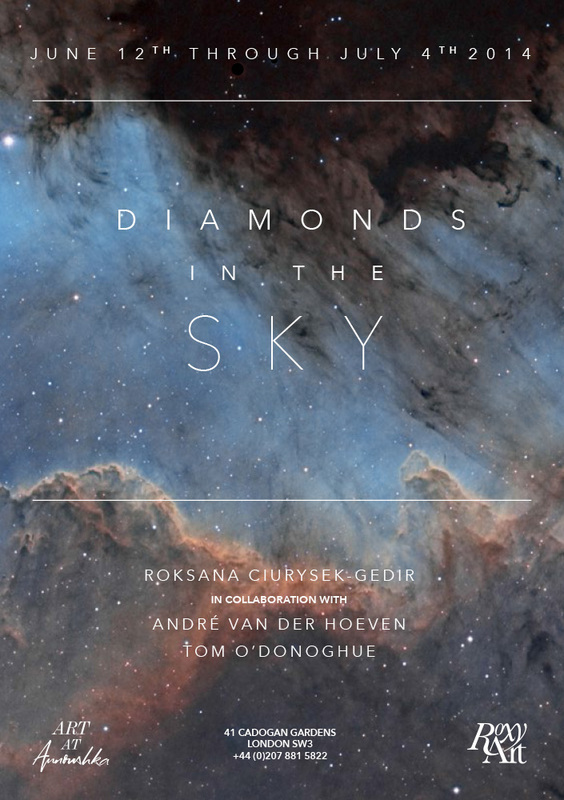 Opening 12th of June through the 4th of July 2014, Diamonds in the Sky will feature diamond and crystal encrusted artworks by Roksana Ciurysek-Gedir in collaboration with award-winning astrophotographers, André van der Hoeven and Tom O’Donoghue. A financier by day and photographer by night, Roksana Ciurysek-Gedir turns her hand as editor and artisan for this year’s Art at Annoushka showcase. 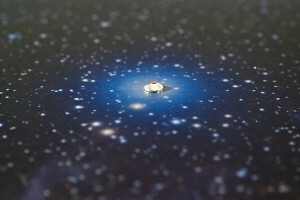 Having been invited to exhibit alongside the stunning jewelry collections designed by Annoushka Ducas, Roksana has selected a series of award-winning astrophotographs to compliment the collections, printing them on brushed aluminium and encrusting the images with diamonds and crystals, an application that has become synonymous with the Roxy Art name. Normally invisible to the eye, the star clusters and nebulae have been captured through long exposure times – some over 20 nights – by astroimagers who sometimes refer to these dense star fields as ‘diamond dust’. Shown together, the embellished photographs and jewelry dazzle the senses and celebrate the magnificent light and color produced within the earth’s surface as well as above it. Roksana Ciurysek-Gedir is widely regarded as a contemporary visionary within her diverging fields as an artist, banker and producer. After gaining an MSc in Management and Economics at Technical University of Gdansk Poland and having studied Art and Photography at Emily Carr Institute, Roksana has gone on to work for some of the world’s most established financial corporations, proving her credentials as a banker whilst earning a revered reputation as a photographer. Her achievements are largely inspired by a multifaceted and creative lifestyle that has enabled her to reach the forefront of success, working exclusively in finance and as an internationally recognized photographer exhibiting in London, Monaco, Vancouver and Azerbaijan. Ranging across a number of varying subject choices, from iconic landmarks to more intimate portraiture, her rich focus and lurid palette manages to somehow remove and elevate the subject from any surrounding context, allowing her images to stand alone; a particular aspect of Roksana’s penchant towards fine photography. 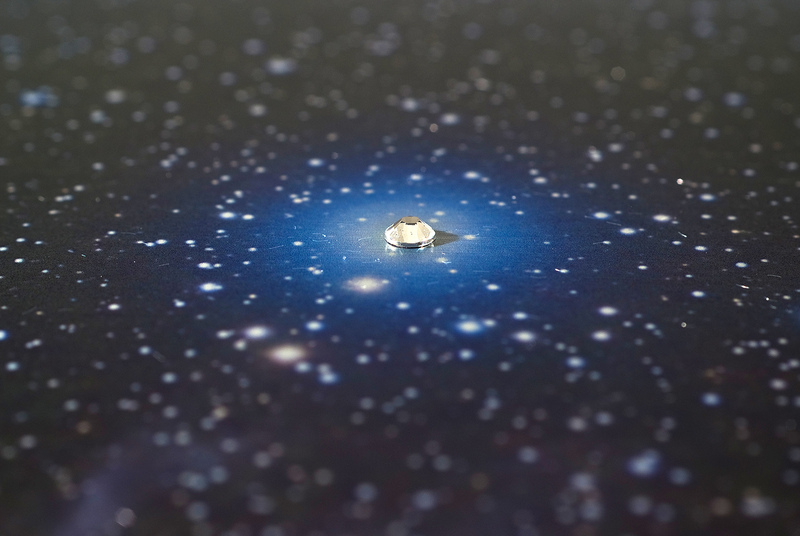 Tom O’ Donoghue is an award-winning Dublin based photographer, working full-time as an astro-imager since 2010. He has had numerous exhibitions in his native Ireland and in 2013 was runner-up in the Astronomy Photographer of the Year Deep Sky Category, held at the Royal Observatory in Greenwich. Tom was also the overall runner-up in the Las Palmas Observatory Astrophotography competition in the Canaries. Born in the Netherlands, André van der Hoeven is a former aerospace engineer who also took up astrophotography in 2010. His images have been published internationally and in 2013 he was shortlisted for the Astronomy Photographer of the Year competition organized by the Royal Observatory in Greenwich.